It’s pretty rare to actually want something to resemble the world of politics. 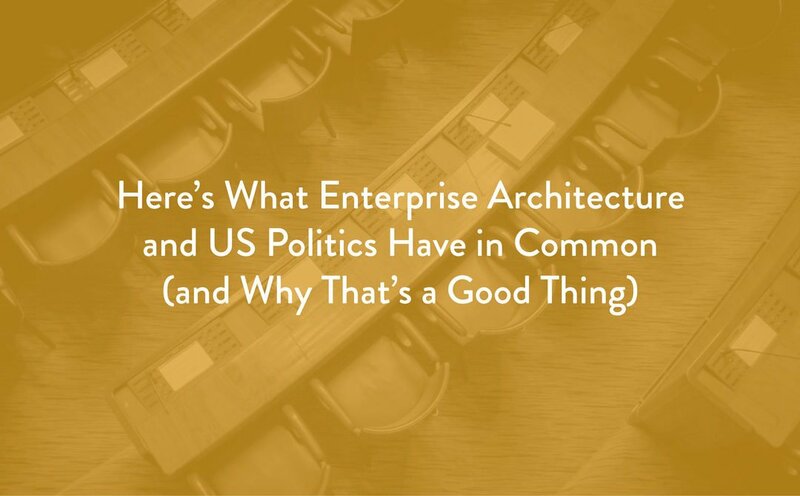 But anyone ever tasked with pulling together an architecture review board will surely see the truth of this statement – as in politics, who you’ve chosen as your representatives could mean the difference between great strides forward or stagnation. In a well-rounded EA the Architecture Review Board (ARB) acts very much like the US House of Representatives, except instead of legislation the items up for approval are solutions. In both cases, the elected governance body acts on behalf of a larger group – the House for the country, and the ARB for the business and its objectives. And in both instances, the responses to two separate concerns will ultimately decide who makes the cut. There must not only be adequate representation but it must be of the right kind. Adequate representation is easy enough to explain. States have certain numbers of representatives. Without them, the state – and in turn, the nation – isn’t fully represented. Likewise, organizational representation on the ARB should be a relatively even sampling of people to bring a balanced view of the business’s strategic concerns to architectural discussions. The question of the right kind of representation is a little more nuanced. The House of Representatives, naturally, is peopled by elected officials. Not everyone is cut-out for the demands of political work, so we elect our representatives from a list of candidates who have already self-selected into the pool. The assumption – ill-founded or not – is that these are people who know enough about what they’re getting into that we can trust they’ll act in our best interest when presented with information we don’t have. They represent the people, but they are also people uniquely suited to the task of representation. This isn’t always the case on an ARB, particularly one recently formed. Not everyone is a natural fit for architecture discussions. This is why it’s not necessarily a given that the representatives on a review board will automatically be the directors or leadership from various departments. But neither should it only be a coalition of techies. ARB conversations are the place to look at a cross-section of projects underway and yet to come and ask some questions. Where are we investing right now? Where do we want to be investing? And critically, are either of those putting us in a place we agreed we want to go? For these reasons, assembling an ARB will require more than just electing the only party member running, so to speak. It requires asking well-thought questions and determining who has the right balance of influence and architectural understanding to contribute to discussion and lend their voice to the strategic future of the organization. The idea of having a say in the future – of a country or an enterprise – is perhaps the overarching and unifying purpose to both institutions. Are the discussions sometimes (often?) unwieldy and tedious? In all likelihood, yes. But is there also vibrant and energetic exchange of ideas? It’s a tough endeavor to set about assembling a diverse cast of talented, forward-thinking individuals engaged in both present realities and how they’ll come to bear on the world of tomorrow. But do not underestimate the incredible things that can be accomplished when such a group is indeed pulled together, and they all want to be there. Nathan Johnson works as an analyst and communications consultant. He has leveraged principles of interpersonal communication across a diverse array of work experiences, from the startup world to small organizational leadership to large-scale EA initiatives.